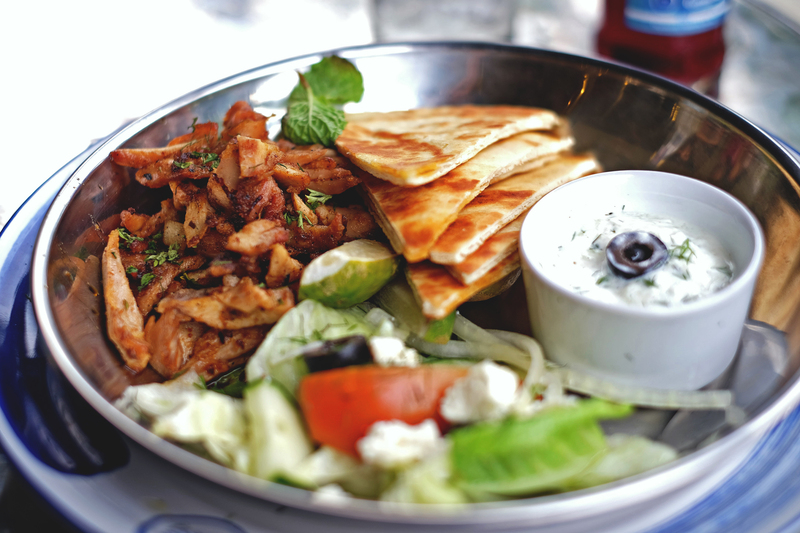 Anybody familiar with Greek cuisine? 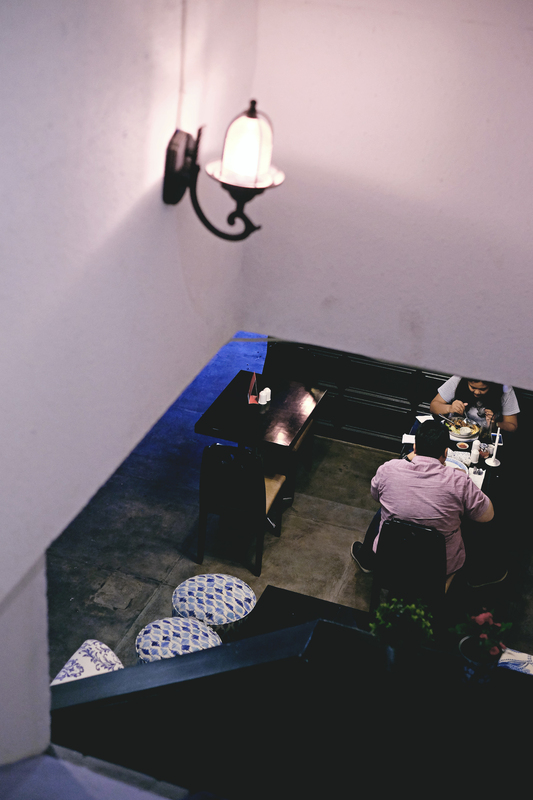 It seems like this type of cuisine has not gotten much attention or exposure here in Jakarta. 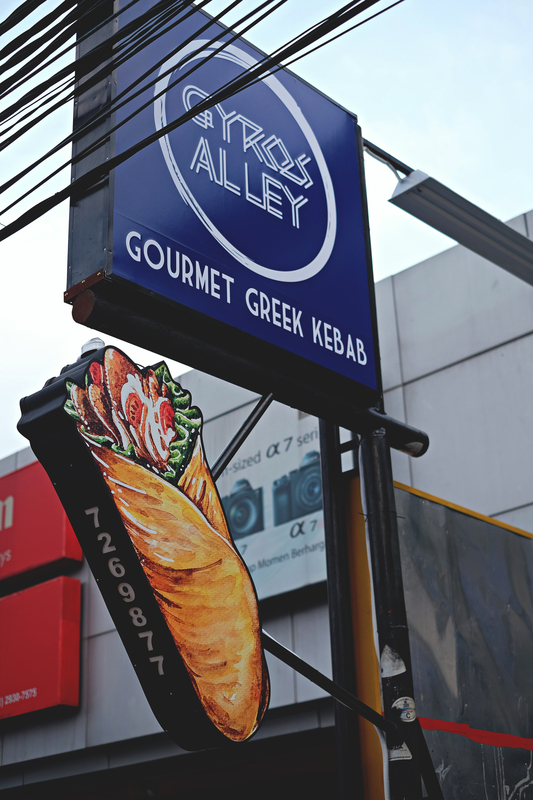 But now it’s available here in Jakarta at Gyros Alley – Panglima Polim and it’s good!! 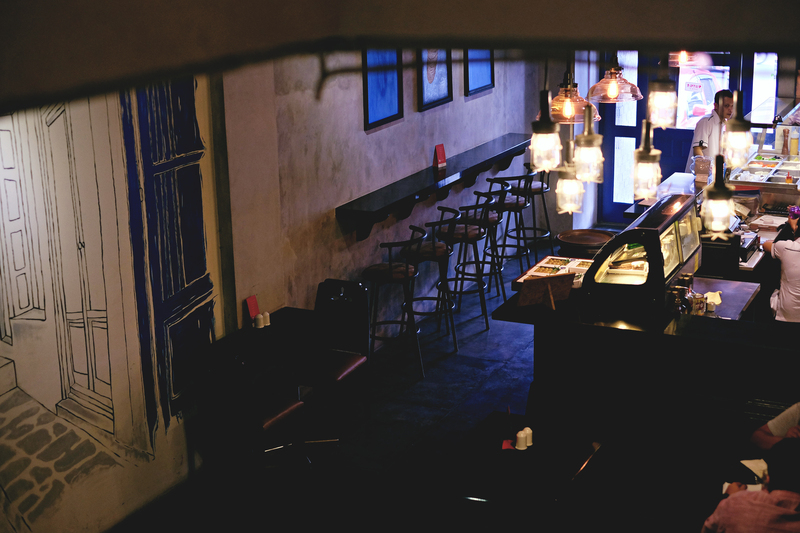 Curious about it?? Let’s check them out. 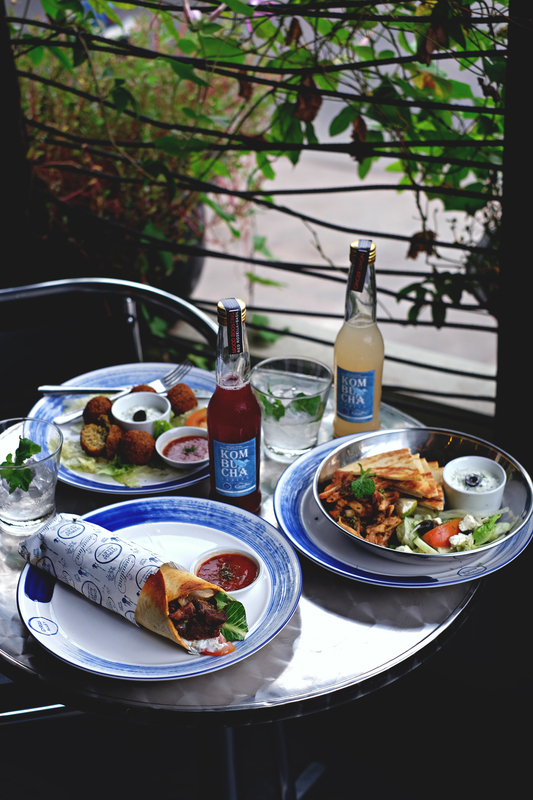 Gyros Alley is a recently opened Modern Greek Restaurant that happens to be the sister restaurant of Casadina. 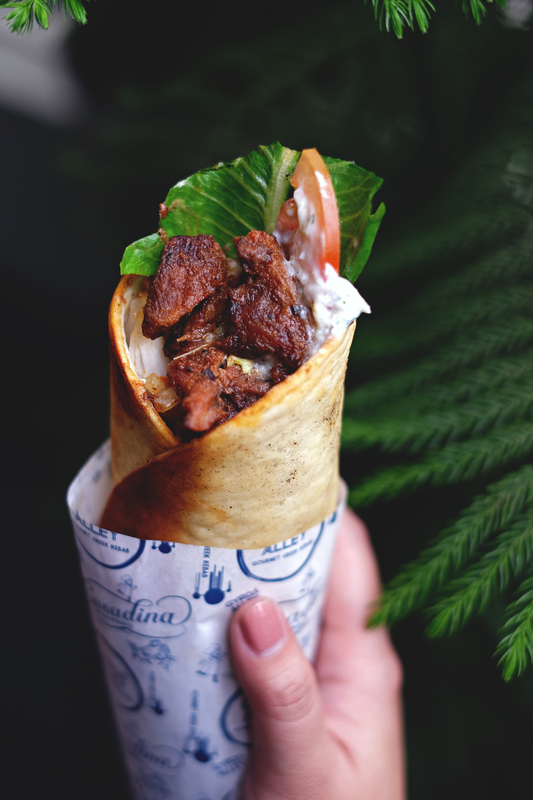 It’s owned by Dina the same owner of Casadina, who is very passionate about her food and based on our great experience at Casadina, we were very excited and looking forward to try the food at Gyros Alley. 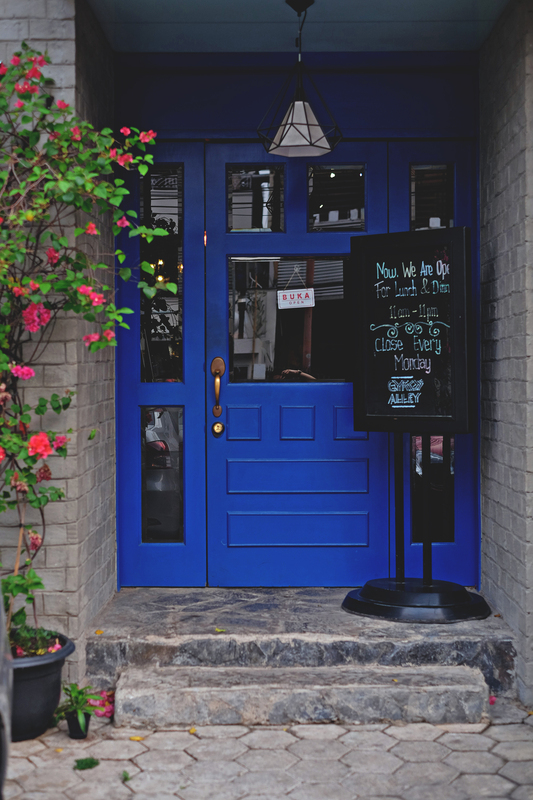 Situated in Panglima Polim south Jakarta area, you can easily spot this restaurant by its eye-catching blue door. 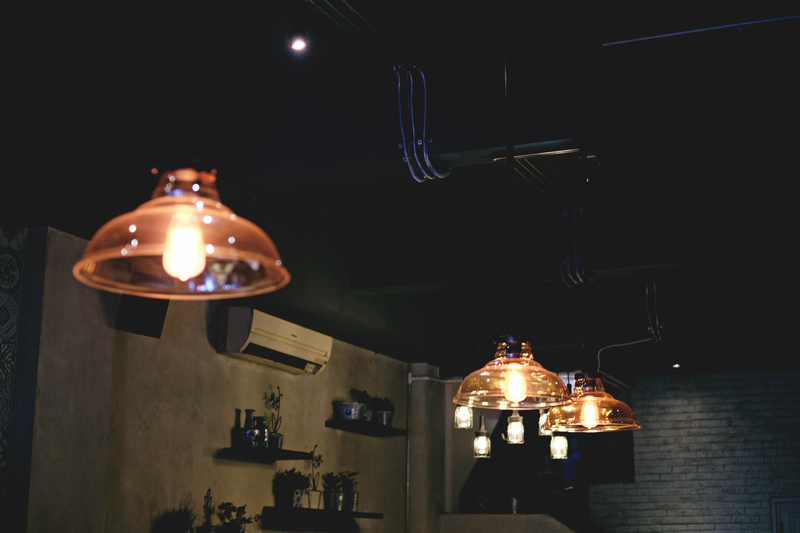 The interior inside is simple and clean with white walls typical Greek style. 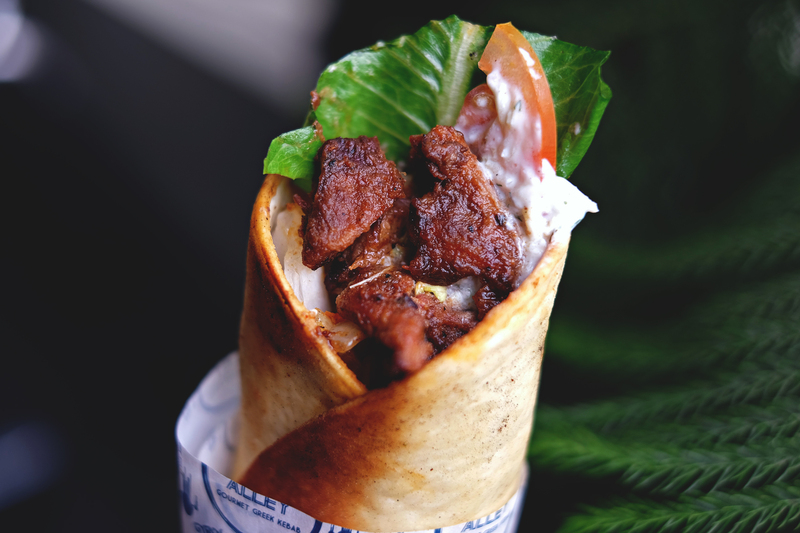 Talking about their food, Gyros Alley is specialized in Gyros, Greek style meat fillet that has been marinated for 42 hours, grilled in horizontal charcoal spit roasted till perfection. 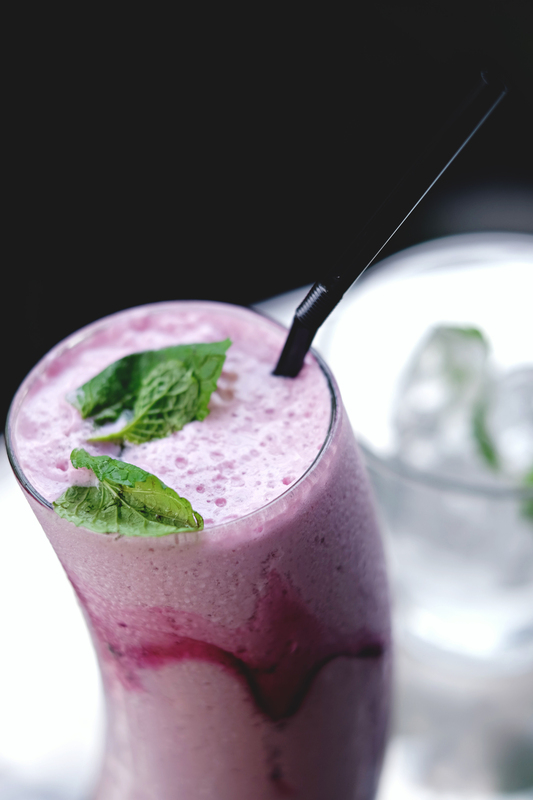 Kefir is a fermented milk drink similar with yoghurt only it contains more healthy benefits such as enzym, friendly microorganism, etc and it’s very good for digestion and health. 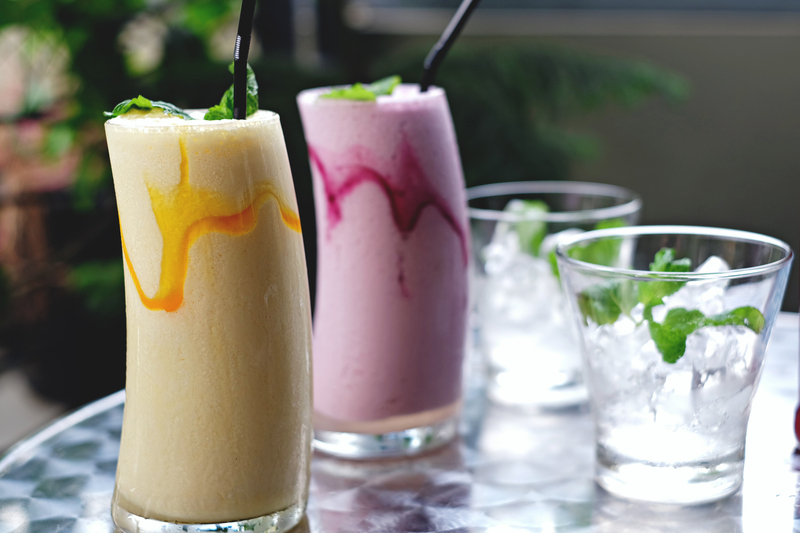 There are four flavors of Kefir Lassi, Mixed Berries, Mango, Strawberry and Vanilla. The kefir tasted pretty similar with yoghurt and our favorite is Mango, sweet sour fruity yet refreshing in every single sip. This is new for us. 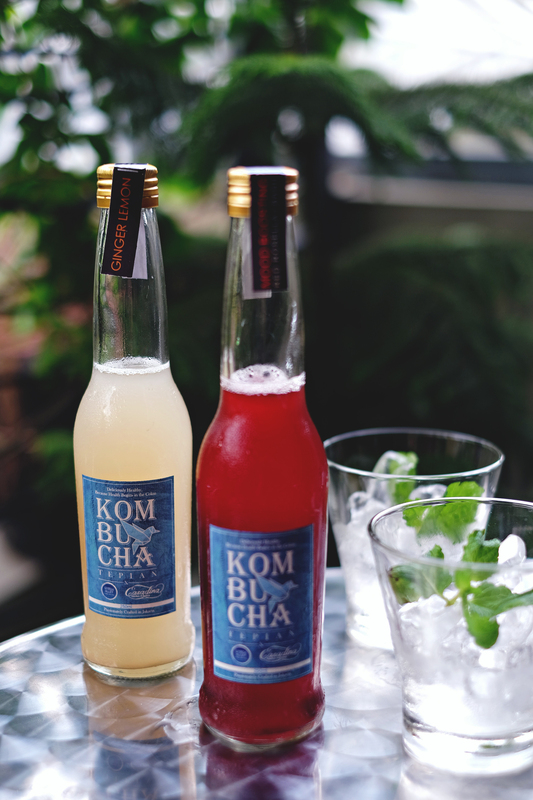 It is is currently a growing-trend on the outside country, fermented organic herbal tea beverage claimed to have a wide range of health benefits, short to say Kombucha is the tea version of yoghurt. 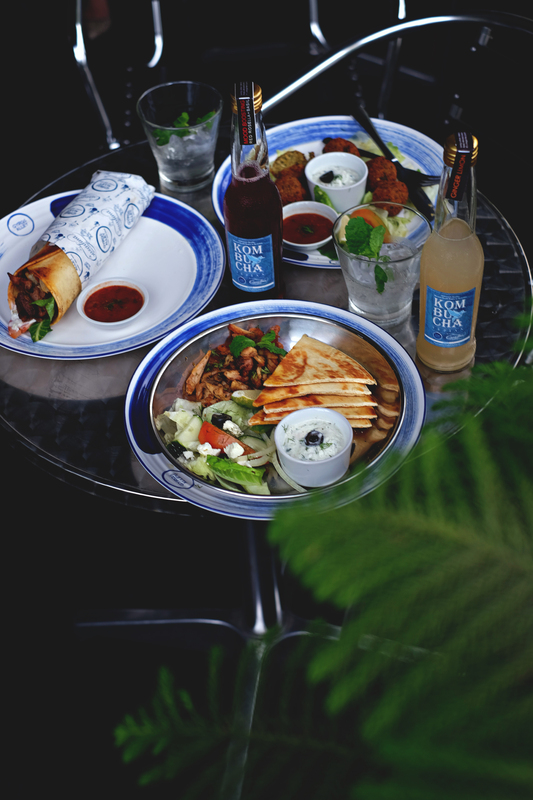 Here in Gyros Alley you can find three flavors of Kombucha Rosella Sweet Basil, Lemongrass Mint and Ginger Lemon. 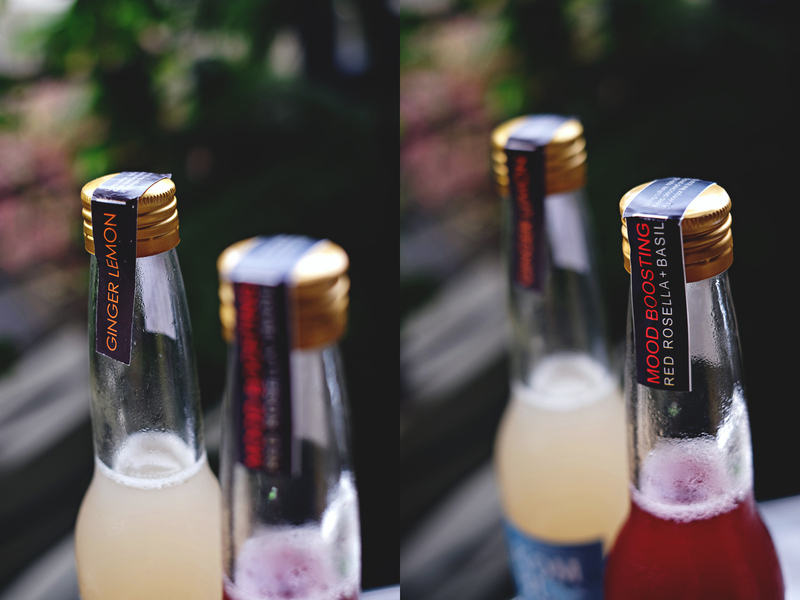 AnakJajan had Rosella and Ginger Lemon, both tasted refreshing with a hint of soda as the result of the fermentation process. 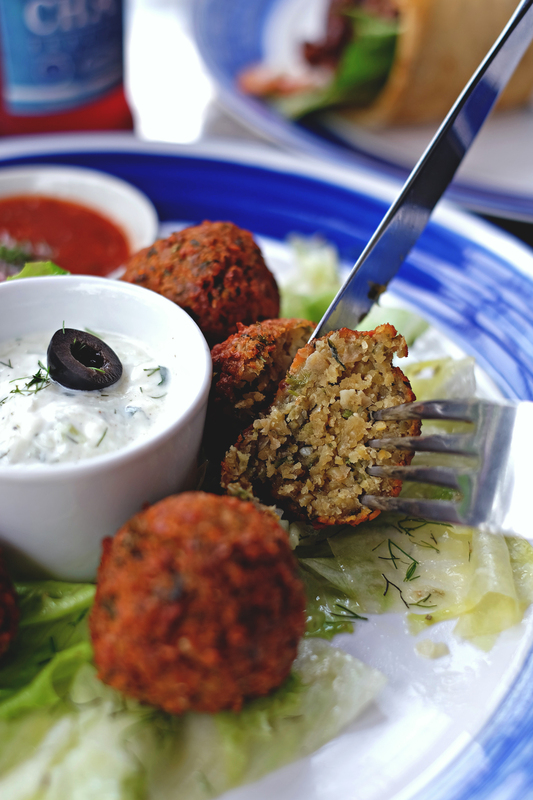 Falafel is a common dish eaten throughout the Middle East, it is a deep fried ball made from ground chickpeas and mixed green herbs served with tzaziki typical Greek dipping sauce made from yoghurt. 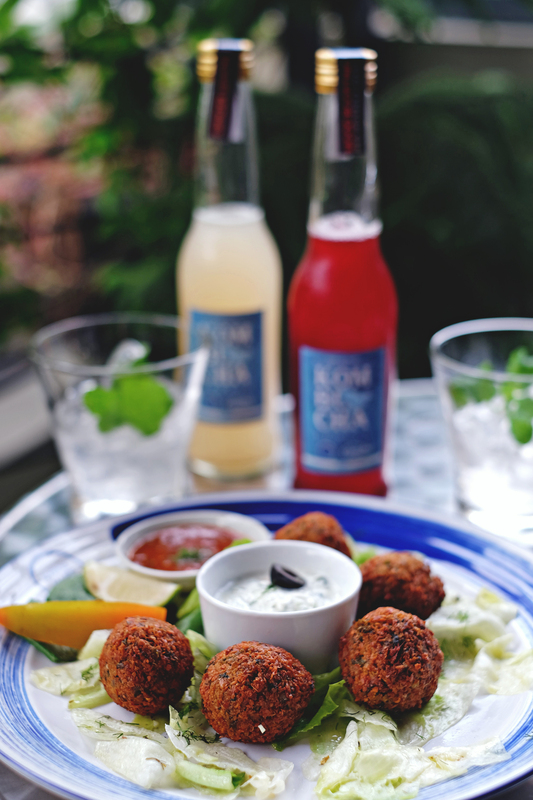 AnakJajan personally enjoyed these fritters so much, it was seasoned nicely with a lovely aroma from the use of herbs and it became more balanced and moist with light and refreshing dipping sauce. 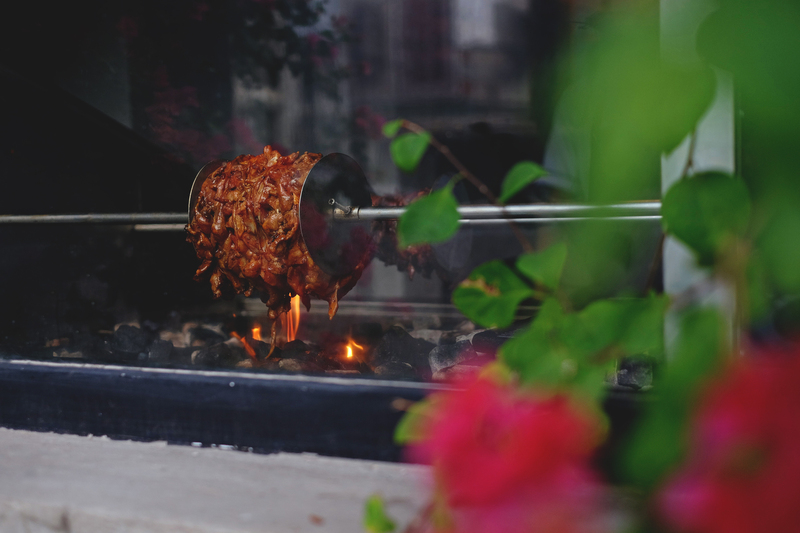 Specially in Gyros Alley, they use lean meat and they cook it in horizontal rotisserie on top of flaming charcoal to let the fat melts and drips down. 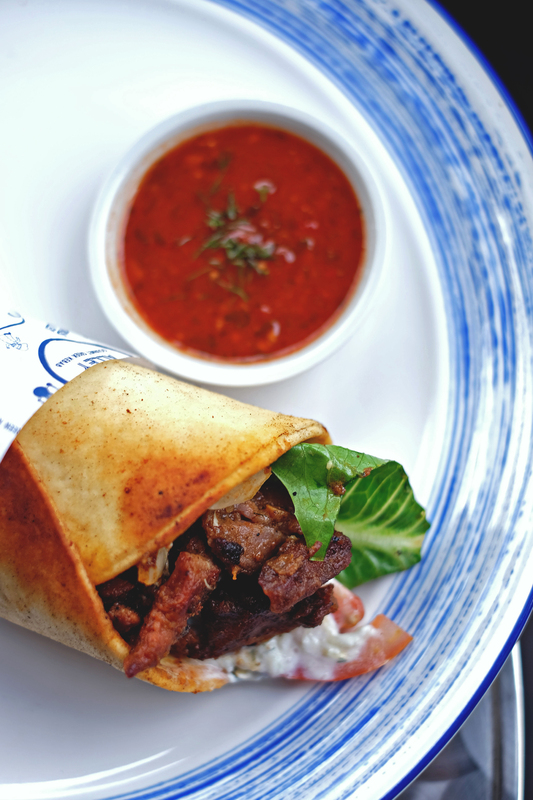 The charcoal roasted meat is wrapped inside homemade pita bread with onion, tomato, tzaziki sauce. The lamb was well marinated and very tender we enjoyed it very much!! And also the homemade hot sauce was spicy and very addicting! 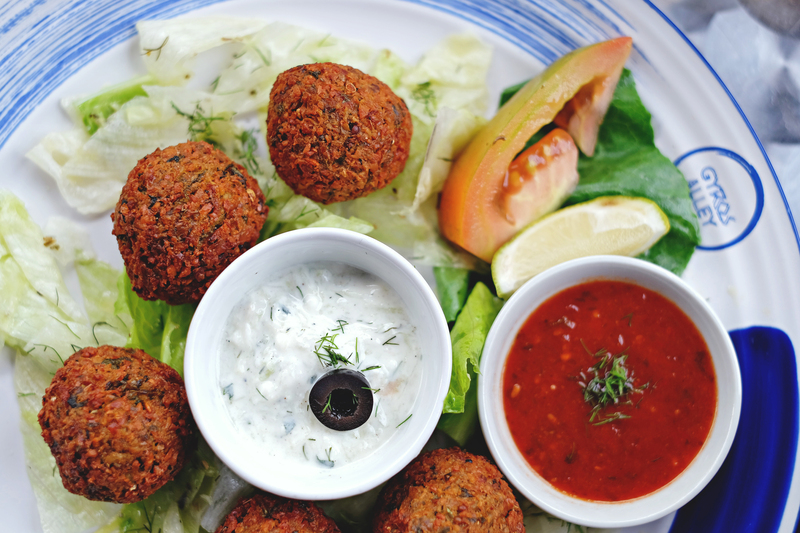 This dish is pretty similar with the dish above where instead of wrapping it together, every ingredients are served separately. 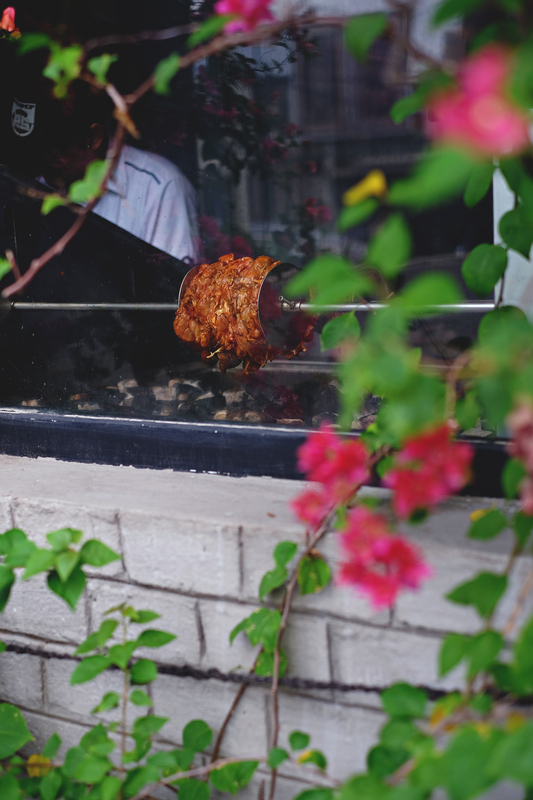 Chicken was flavorful with intoxicating charred aroma but AnakJajan personally prefer it to be wrapped as it tends to be more moist. 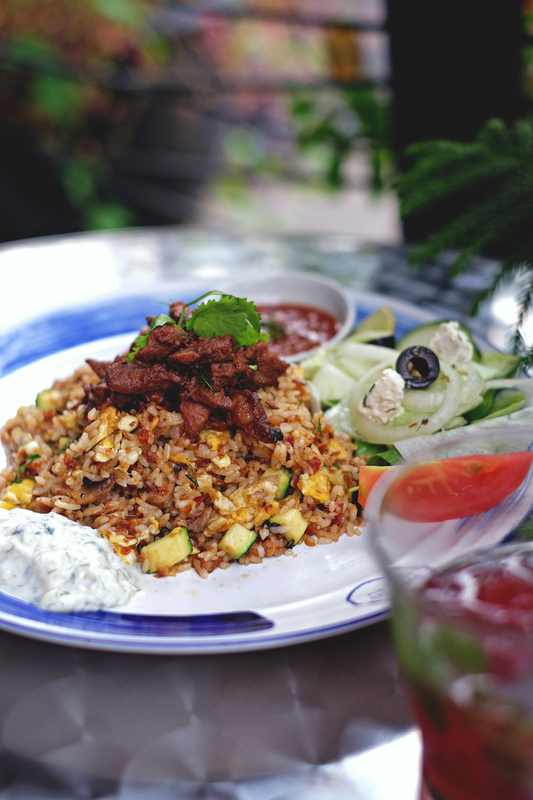 Fried rice with Mediterranean herbs and spices with roasted meat. 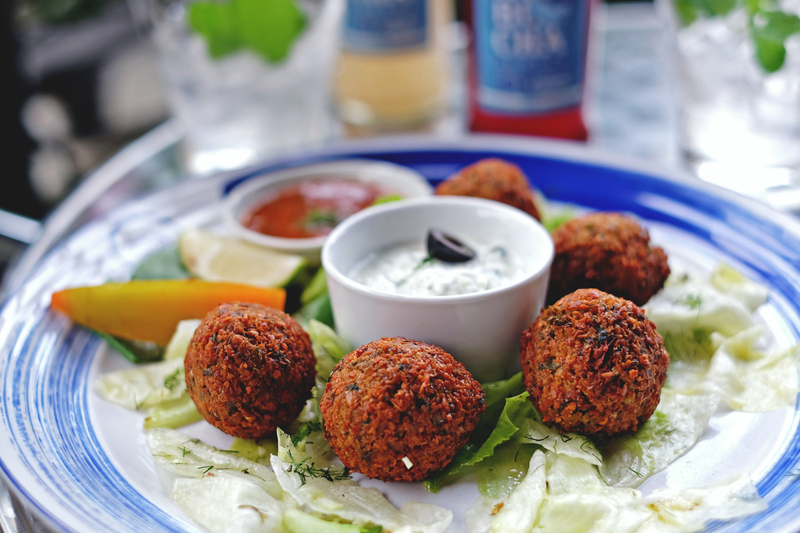 It was extremely satisfying and tasty with perfect amount of herbs and spices aroma, sooo good! 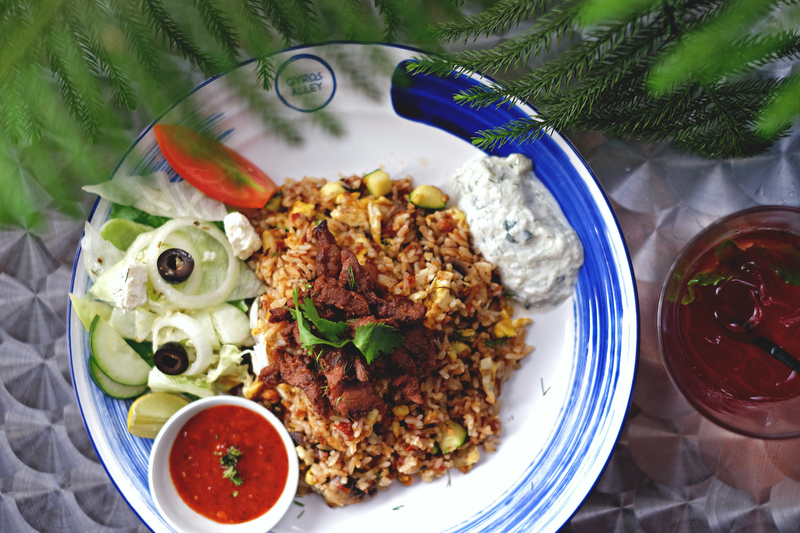 The roasted lamb was so good and didn’t have any unpleasant lamb aroma even Mr. Jajan a non lamb lover also enjoyed it very much. 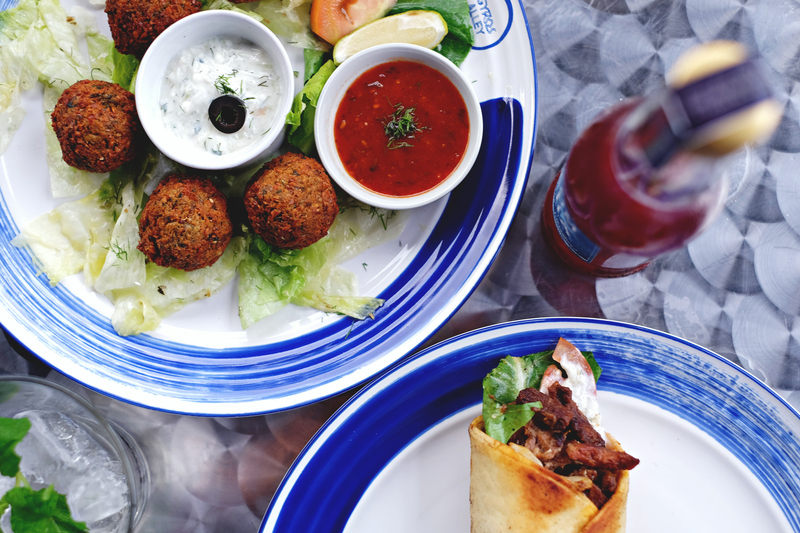 FYI, three of dishes above is available in three options Lamb, Chicken and Falafel for vegetarian. 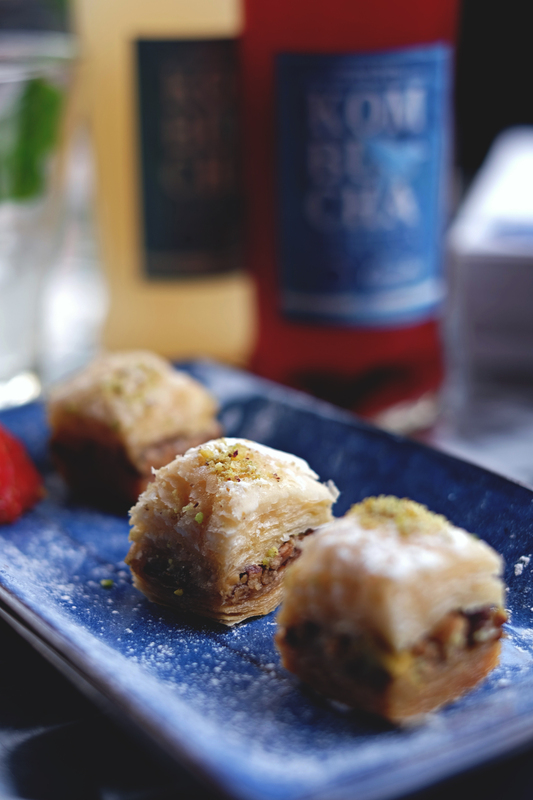 Baklava is a typical Turkish sweet pastry made of layers of filo pastry, butter, walnut, pistachio with lemon honey glaze. 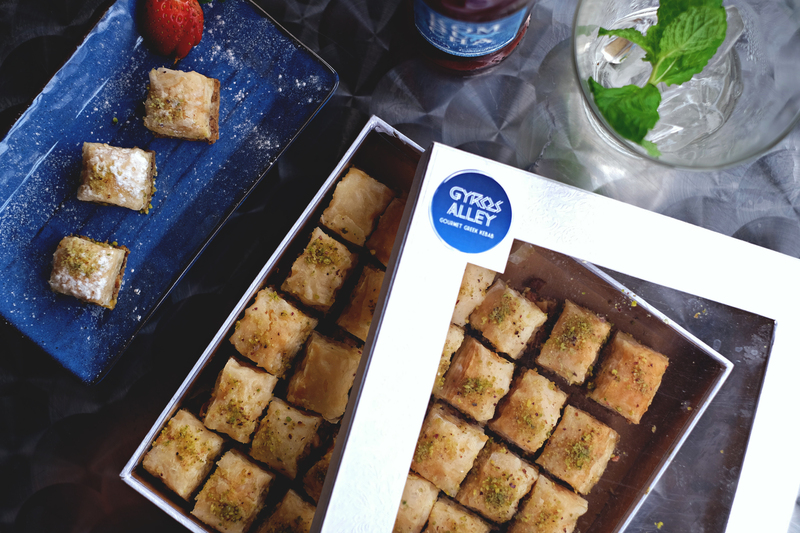 Normally Baklava is filled with sooo much sugar it’s too sweet and sticky that’s why Gyros Alley adjust the sweetness of their Baklava to tailor Indonesian palates so we can enjoy it better. It’s crunchy, nutty and buttery, taste the best with a cup of tea. FYI, the Baklava is also available in box version, suitable for present. 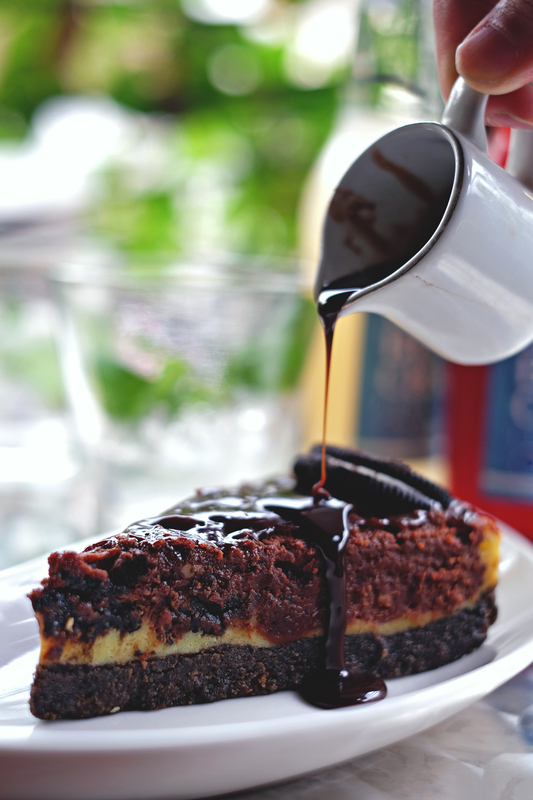 Shiny glossy three layers of cheese cake with moist texture and rich of Oreo and Nutella flavor. 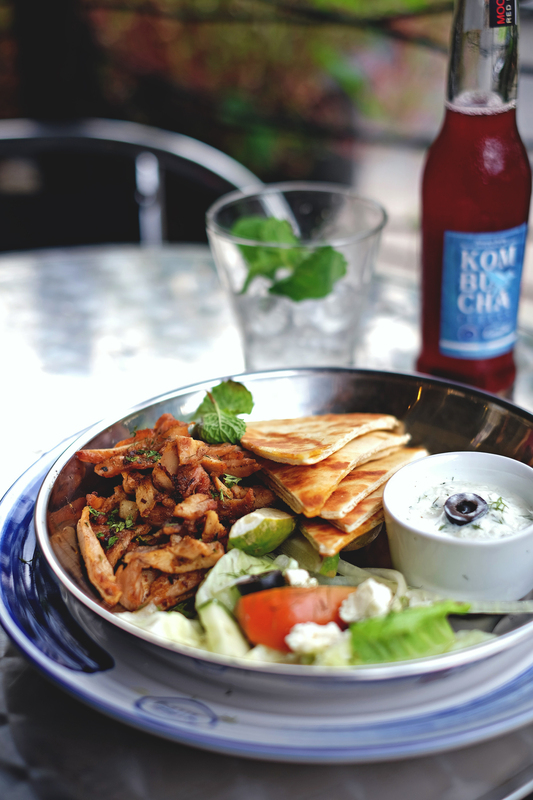 This dish is normally enjoyed as appetizer in Greek but since it’s more on the sweet side, AnakJajan had it as dessert. 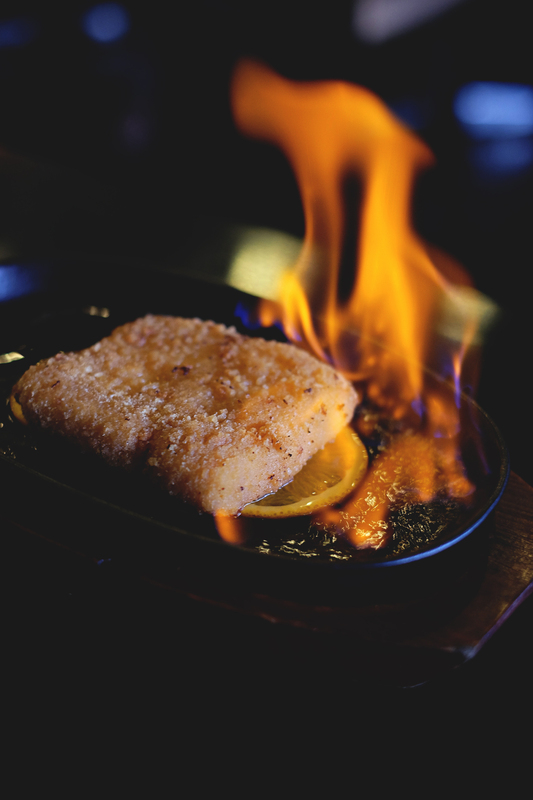 Greek-style pan fried battered cheese served in syrup, lemon and flaming liquor. 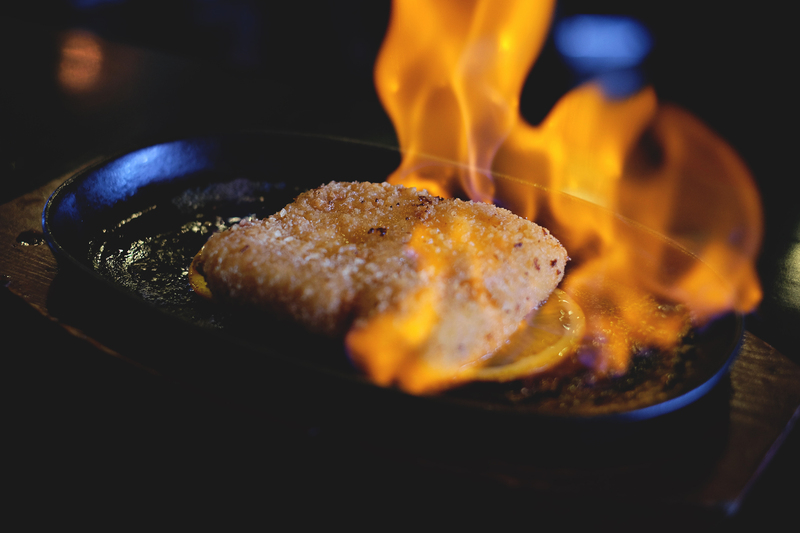 It was sweet, savory, creamy, a must have for cheese lovers! 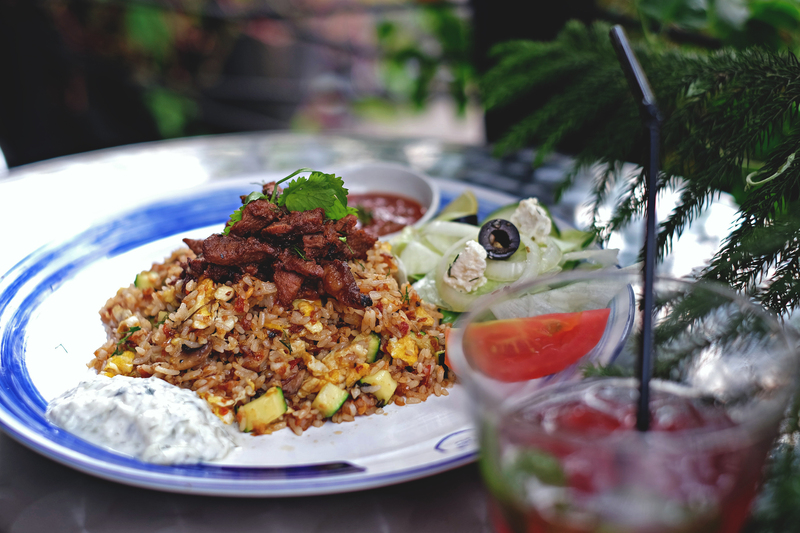 Overall, AnakJajan love the fact that everything is homemade including the pita bread, meat, seasoning till sauce with a great flavor. 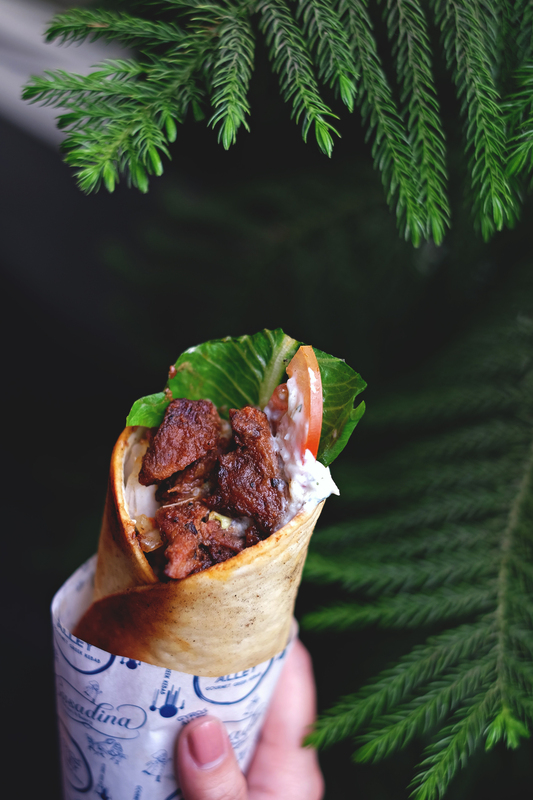 We had a great time and enjoyed Greek cuisine offered by Gyros Alley, in fact I’m craving for it already while writing this post. Let’s Jajan!